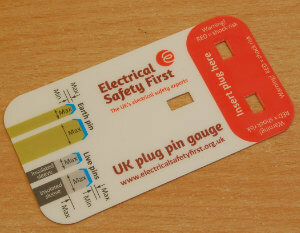 Electrical Safety First, the UKs electrical safety campaign organisation, have recently introduced a new plug pin gauge. This simple piece of laminated card is cleverly designed to help consumers easily identify counterfeit and sub-standard plugs, chargers, and adaptors. A plug should be able to slide easily into the holes on the card. This counterfeit USB charger can only fit part way before becoming stuck, indicating that the pins are incorrectly spaced. 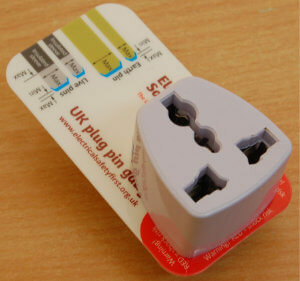 The plug must also completely cover the red zone on the gauge to meet British Standards (BS1363). The gauge clearly shows this dangerous plug adaptor is an incorrect size and should not be used. 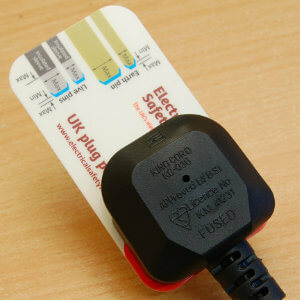 This counterfeit plug has a fake BSI Kitemark logo and registration number, but the gauge shows it's not correct size. BSI registration numbers can be looked up on the BSI website. The licence number on this plug, KM41231, is not registered. 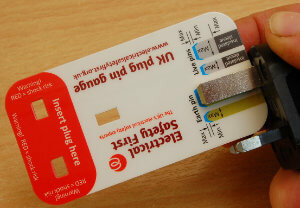 The length of the pins and sleeves can also be checked against the gauge on the side of the card. 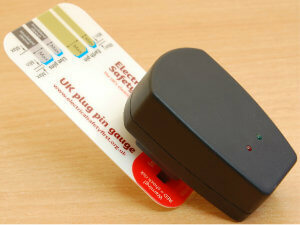 You can purchase your own UK Plug Pin Gauge from the Electrical Safety First website.